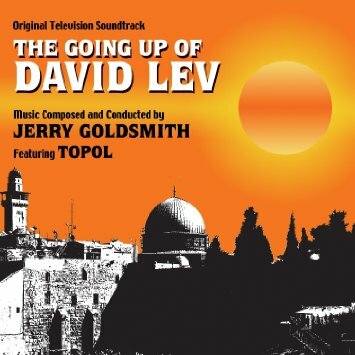 Of Jerry Goldsmith’s few scores that drew on the music of his Jewish heritage, The Going Up of David Lev is the most obscure. Written for a television special made to commemorate the 25th anniversary of the State of Israel, it musically embodies two sides of Jewish culture — sorrow and hope — in colorful, alternately poignant and exuberant terms. The all-star cast included Topol (in his American TV debut, and singing two original songs), Brandon Cruz, Claire Bloom and Melvyn Douglas; the 78-minute film was filmed entirely on location in Israel, yet aired only once on NBC in 1973. Variety raved: “an extraordinarily full and melodious score by Jerry Goldsmith which reflected the spirit of the nation without ignoring the needs of the narrative.” It was a joy to help bring this forgotten score to wider attention. This entry was posted in Composers, Television Music and tagged 25th anniversary of Israel, Brandon Cruz, Jerry Goldsmith, Jewish music, The Going Up of David Lev, Topol on August 24, 2010 by Jon Burlingame.